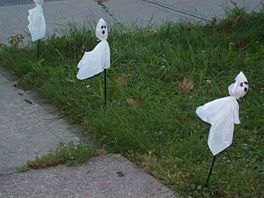 Here are five simple ways to make ghosts out of plastic bags for a spooky bit of Halloween fun. For this version, you will need a balloon, string and a large white plastic garbage bag. Blow up the balloon and place it inside the bag. Gather the bag under the bottom of the balloon and tie off with string to make the ghost’s head. You can decorate the ghost by adding a spooky face with markers if you wish, or just leave it plain. Add a second piece of string to the top of the ghost to hang it up. For this ghost, you will need several white plastic grocery bags, string and cheesecloth. Simply ball up several grocery bags and place them inside another white bag. Form this into a round shape for the ghost’s head. Drape the head with cheesecloth and tie off underneath with white string. Floating ghosts can cause quite a stir on Halloween! 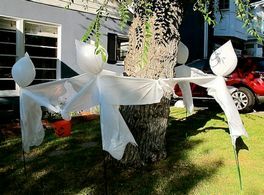 For this craft, you’ll need a white helium balloon for each ghost, markers, sticky tape, plus two white plastic grocery bags. Cut the handles off the bags, then cut the remainder of each bag into one inch strips, cutting from the open end to about two inches away from the bottom seam. These will form a skirt for the ghost. Use clear sticky tape to fasten one cut-up bag halfway around the bottom of the balloon. Put the second cut-up bag around the other half of the balloon. Draw on a spooky face with markers – and don’t forget to tie a string to the bottom of the balloon to keep the ghost from flying away! 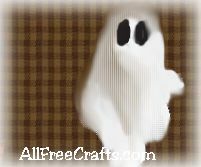 Learn how to make spooky Ghosts in the Grass from Wikihow. These are made from eight or ten inch squares of white plastic cut from bags, with a crumpled newspaper head and a centered dowel post for inserting into the lawn. I found these dancing Ring Around the Rosie Ghosts at HomeJelly and think they are delightful. Basic supplies are white kitchen garden bags, balloons and garden stakes.